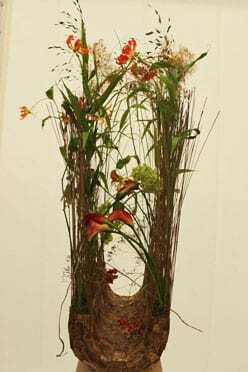 I hope you enjoyed Part 1 of Flowers at Chicheley Hall 2011 yesterday. 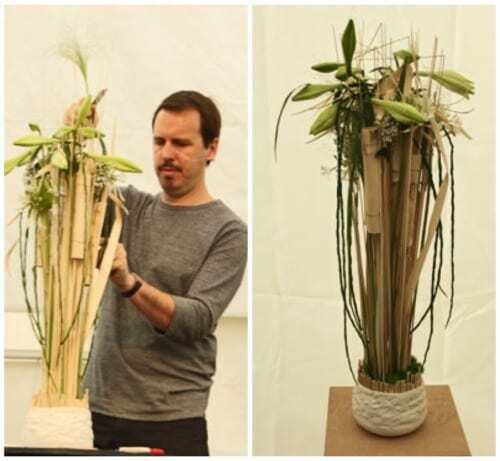 Today’s post features three international floral designers who gave demonstrations at the event, starting off with Gregor Lersch. 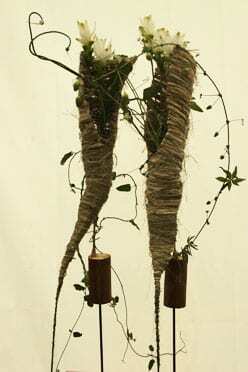 Gregor, who is German, has written many inspirational books on floral design. 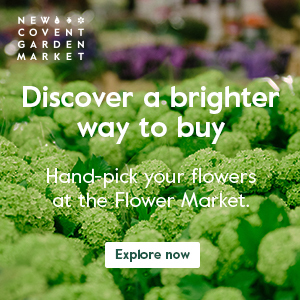 And when I was studying floristry at Southwark College, he was the first international florist that I became aware of…so it was a real treat to see him live on stage. With an amazing grasp of English, his demonstration was very entertaining. We all watched in awe as he created a range of designs from different styles of hand-tied bouquets to table arrangements. I loved his comments which included ‘A bouquet is an emotional message between two people’ and ‘If you love a particular flower, then you should know its name’. He also said that florists need to educate people to buy flowers for themselves, not just to give as gifts. 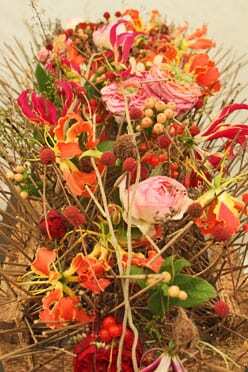 Below is my favourite design which Gregor created using orange gloriosa lilies in small tubes, berries, hydrangea and scrunched up black wire. He showed us the technique he uses to scrunch up the wire so that it doesn’t unravel, which involves making loops and threading through them. 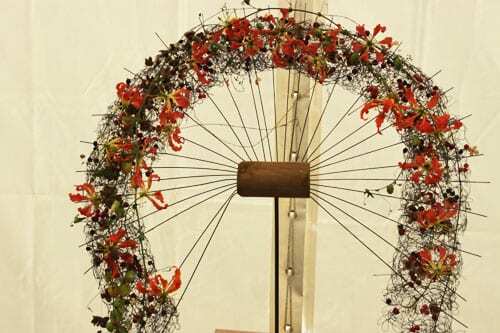 He believes that the gloriosa lily, which is the national flower of Zimbabwe, is the flower of the future. And I loved the vibrancy and movement which it brought to this design. Next up on stage were Mark Pampling and Moniek Vanden Berghe. 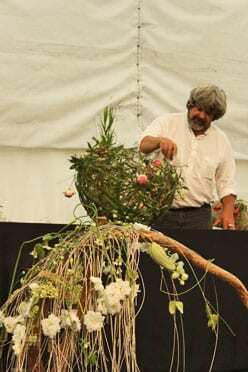 Mark is one of Australia’s foremost floral designers and as well as having his own floristry business, he is also internationally renowned as a demonstrator and teacher. 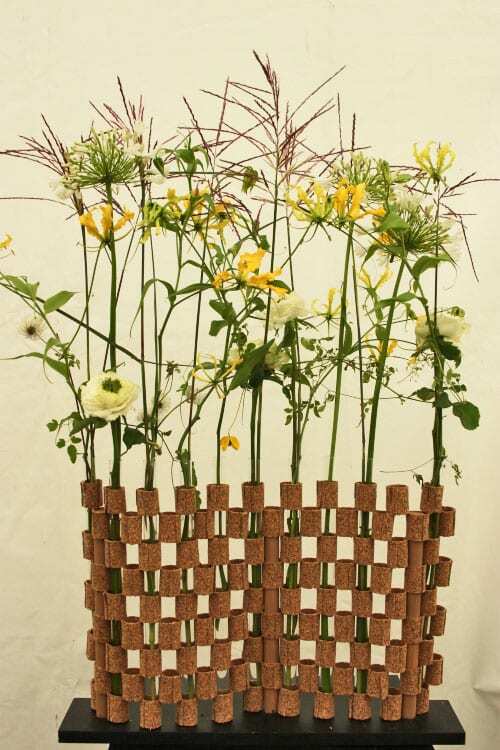 He said that when creating designs, he likes to exaggerate proportions, including the height of his arrangements. 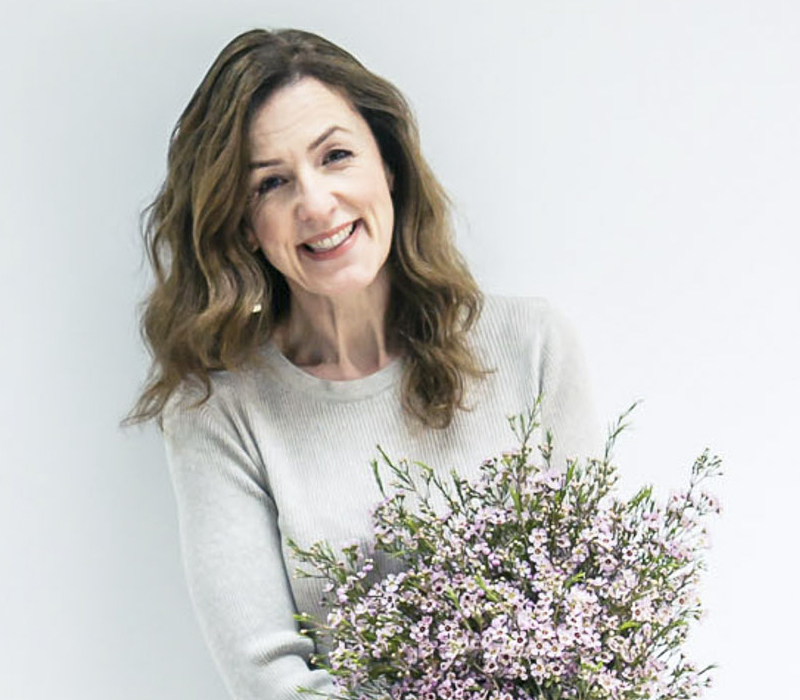 Moniek is based in Belgium and teaches and conducts floral demonstrations all around the world, from America and Australia to Mexico, France and the UK. I loved the design she created above using yellow gloriosa lilies, white agapanthus and white roses. The roses, which are also featured in her design below in pink, are a new variety which will be available in the UK next year. 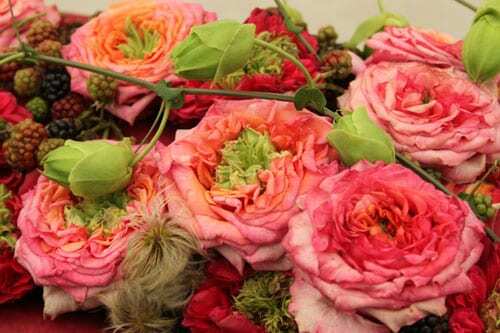 They’re a ranunculus type of rose called Belle Ami, with a green ‘eye’ at the centre. This design was my overall favourite of the day (hence the two photos! )…I loved the combination of colours and textures. 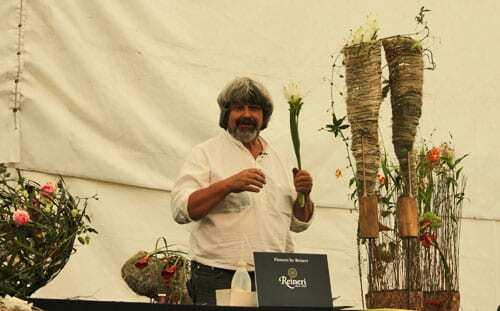 Peter de Mos from Reineri, who supplied the flowers for the demonstrations, was on hand to answer questions. And the audience were very pleased to hear that roses with fragrance are coming back. He also said that gloriosa lilies were very on-trend and he felt that delphiniums are making a comeback. However, the most popular flower this summer has been the white hydrangea, due to its use at weddings. 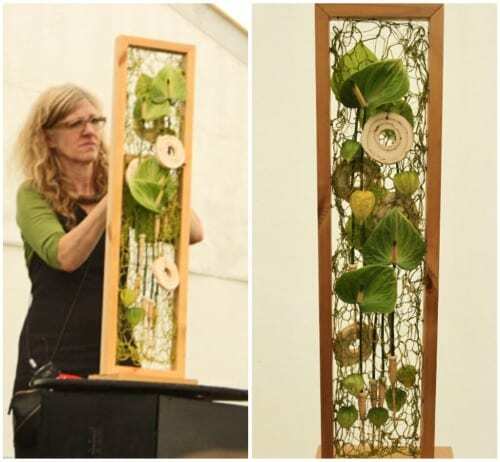 All three floral designers wowed us with their stunning arrangements. 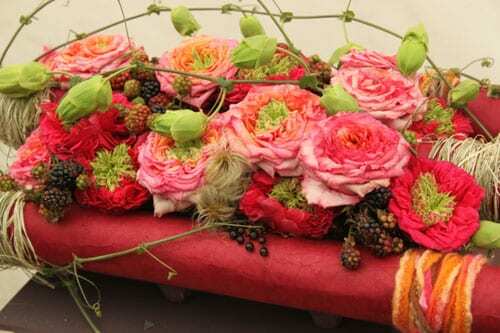 They are very much the haute couture fashion designers of the floristry world and their work is more like floral art…which florists can take inspiration from for their own designs. Many congratulations to Judith Blacklock and Fleur Events for organising such an amazing event in the UK. You’re very welcome. Gregor has such a talent doesn’t he…and is also very happy to share all his knowledge, plus he is so entertaining in person!